The people of Pattanam have always known their village had a rich heritage: Every time they dug up a patch to plant a coconut tree, they would discover an ancient artefact. And now, four trenches dug deep in the backyard of the vacant Padamathil house, next to the Neeleswaram temple pond, bear them out. Evidence unearthed in this small village on the Kerala coast suggests that this was the site of the lost port of Muziris. Till recently, Kodungallur, a town 7km north of Pattanam, was thought to be the site of Muziris. 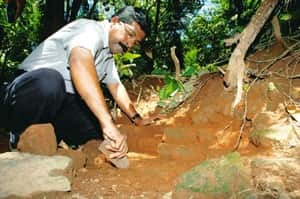 Though artefacts from the 13th to 16th centuries were recovered during excavation in Cheraman Parambu, Kodungallur, in 1945 and 1969, they were not considered conclusive. And now, the fourth season of the Pattanam excavations—an ongoing project of the Kerala Council for Historical Research—has revealed far deeper connections between this spot and the Roman Empire. With campsite in-charge Preeta Nayar’s permission, I climb down the ladder into one of the trenches and am instantly transported 2,300 years back in time. The clinching finds here are shards of various kinds of pottery, from the Campanian pottery of south Italian origin (irregular black volcanic elements in red clay) to the Mesopotamian turquoise-glazed pottery. The Padamathil site has also thrown up many shards of Mesopotamian torpedo jars, which were lined with bitumen to prevent their liquid contents—possibly date syrup and sesame oil—from evaporating. Amphora shards and terra sigillata (a red sintered surfaced tableware) have also been found at the site. Ancient Romans were known to use amphoras for wine, olive oil and fish sauce. I wondered why the residents of Muziris would have imported olive oil. It’s not, however, just the recovered artefacts that have a story to tell—the trench walls do too. Since this region was inhabited continuously from before the Roman period and possibly even during the Iron Age (10th-5th century BC), the walls are chronological records in themselves. Different-coloured soil indicates various time periods—the oldest being the late BCs—with the lowest layers indicating the earliest periods of inhabitation and human activity. A basic knowledge of the origin of artefacts yielded by the trench walls can help date the cultural and commercial exchanges. Apart from the “foreign" pottery—from Mesopotamia, Rome, China and north India—the area has thrown up shards of local pottery as well, besides beads, thickly corroded iron nails and lead spirals with lead carbonate coating. Large quantities of shards of rouletted ware (pottery produced by a roulette, a toothed wheel) point towards a connection with the Bengal-Gangetic region. It helps historians conclude that Muziris’ trade network extended to the interiors of India, as well as Europe and West Asia. The trenches also contain bricks, whole and in pieces. According to the archaeologists, no structure could have existed in the trench I stood in. So was this place a dumping ground for unused bricks? During an earlier excavation, a brick structure was found in a compound nearby. Were these fragmented bricks leftovers from that construction? I am also surprised to learn that a terracotta ring well—basically, large rings placed one on top of the other to create a circular well, a practice dating back to the first centuries of the millennium—had been discovered in one of the trenches. Kerala still builds wells in this manner, only substituting concrete for terracotta. The glass and gemstone beads found in Pattanam hint at flourishing commerce, and also at local gemstone bead-manufacturing activity. Digging here has unearthed stones at various stages of production, from the raw to the finished product. However, all the glass beads are finished products, triggering the idea that Muziris could have been an export base. What tools did the ancient Muzirians use? Were the corroded iron nails found here part of their toolkit? Did this compound house a bead-manufacturing factory at one time? What did they use lead spirals for? These are questions only archaeologists can answer. Sieving the earth some moments later, I find a chalcedony stone. It probably came here from north India to be processed and exported. And never made it out. Was this a discarded piece? Or did calamity strike while the craftsman was working on this stone? Some answers are beyond even the archaeologist. Muziris is mentioned multiple times in Tamil Sangam literature and classical Graeco-Roman accounts such as Periplus of the Erythraean Sea and Pliny the Elder’s Natural History. Pliny describes Muziris thus: “The shipping station is a long way from the land, and cargoes are brought in and carried out by light boats." The remnants of canoes and bollards recovered from earlier excavations let us connect these dots. The Periyar changed its course. The water table went down—a hypothesis corroborated by the peat formations at the bottom of the trench—and a whole town disappeared. Yet, thanks to the things they left behind, it’s easy to construct a shimmering sepia image of a buzzing port, bustling traders, and barter that transcended all barriers. Pattanam is situated between Kodungallur and Paravur in the Ernakulam district of Kerala, about 25km north of Kochi, and just 10 minutes off NH17. Excavations have been on at Pattanam for the past four years. When they’re under way, the general public is welcome during visiting hours (usually 2-5pm). Permissions are granted on the spot by the Kerala Council for Historical Research. Log on to www.keralahistory.ac.in for updates on upcoming excavations.